Friday night fish fries are a big deal in many parts of the country often too big of a deal for those who don’t like waiting in line or putting up with crowds. And even if you can get your hands on a first-rate batch of fish and chips without waiting for an hour or sitting elbow-to-elbow with a hundred of your closest friends, nothing can replicate the magic of frying up your own cod or haddock fillets in the comfort of your own kitchen. It is a paradox that some of the easiest, most fun fish to catch are also among the hardest to cook well. Small, bass-like fish those with largish heads, prickly spines and large rib cages really need to be at least a good foot long to be worth filleting, and even that’s a small fillet. The answer is to cook them whole. You get exponentially more meat off each fish, you waste less and, well, it’s just damn fun to tear into a whole fish at the table. There’s something primal about it I really like. Virtually every culture cooks whole fish in some way, shape or form. The people of the editerranean, from Turkey to Spain, grill whole fish as good as anyone. You can bake a whole fish in salt. The Chinese steam them, then pour sizzling chile oil over them right before you eat them (gotta try that). In Sichuan, one of their signature dishes is sweet and sour crispy fish, which I make a lot. I thought I’d make it again when I got home from Southern California recently, four pretty Pacific rock cod in my cooler. I had a great time catching them on the New Del Mar, easily landing my 10-fish limit. I gave away most of my fish to some newbie anglers who were not so lucky. But as I drove the long trip home Santa Monica is a solid 6 1/2 hours from my house in NorCal I thought I should do something different. Spring is here and I wanted a lighter, fresher kind of fish. My thoughts immediately went to Southeast Asia, where they are geniuses with fresh herbs, citrus and chiles. Then I remembered a recipe in one of my favorite cookbooks, Cooking from the Heart: The Hmong Kitchen in America. Hmong are a group of Southeast Asians who fought with us against the Communists in Vietnam, and after the war thousands came here to live. There are large Hmong communities in Minnesota’s Twin Cities, in San Jose, Fresno and here in Sacramento, California. I happen to like the Hmong. They’re good outdoorsmen and generally nice people in my experience. Long-time readers of HAGC might remember that I’ve cooked a few Hmong dishes before, like their awesome, herby country-style sausage and a fantastic squirrel stew. Hmong food is generally a country cousin of Vietnamese food, which can be quite refined. Lots of fish and game, lots of fresh herbs, chiles, citrus and fish sauce. Frying oil gets hot—more than 300 degrees hot, to be precise. Not everything can stand up to that kind of assault long enough to cook through. Soft, overly fleshy fish tend to break up in the high-temperature, high-pressure environment of a frying pot. So if you’re serious about making a fish fry to remember, you need a fish that can get the job done. On the cheaper side, haddock, cod and catfish are all suitable. If you’re looking for a higher-end option, go with snapper, grouper or redfish. Your home frying operation won’t go through nearly as many fillets as the restaurant it replaces, but that shouldn’t stop you from opting for a durable oil that can take a lot of abuse. With a neutral baseline flavor and a high smoke point, cottonseed oil lasts about half as long as other common frying oils before it needs to be changed. Depending on the size of your party, that can mean the difference between stopping mid-fry to change your dirty oil or riding your original batch to completion. How can you tell when a fillet is fried through? Simple: wait until it floats, then wait a little bit longer. As fillets fry, they lose density and begin rising to the surface of the pot. While they’re not quite done when they first hit the air, this milestone means that they’re well on their way. Give each floater another minute or two, then take it out to cool. 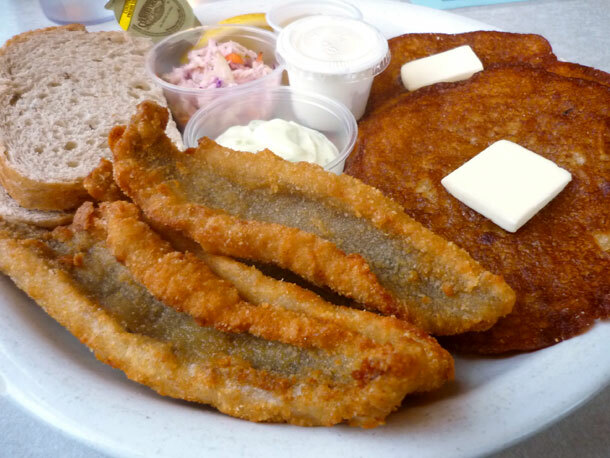 Bring up the subject of batter in the company of an avid fried fish fan at your own risk. But in polite company, it’s OK to debate the relative merits of yellow cornmeal and panko. That said, one coating—plain white flour—gets very little love, and with good reason. White flour may be too insubstantial to hold up in the fryer, flaking off and leaving naked, exposed fish flesh before the fillet cooks through. It might be a whole separate recipe, but that doesn’t make it any less important. Without tartar sauce, your fried fish—whether cod, haddock or highfalutin snapper—just isn’t going to taste the same. Do yourself a favor: Make and refrigerate a batch before firing up the fryer. Otherwise, you’ll be stuck with ketchup and hot sauce. Frying fish at home is more art than science, and this list could easily be three times as long. But, taken together, these easy-to-follow tips create a great base for a successful frying experience. If you’re willing to get some batter on your hands, you might just be able to avoid the rush next Friday. This recipe is killer. Absolutely killer. The trick is to crispy fry plate-sized fish until the bones and spines soften, then tear into it. You end up eating about a third of the bones, which are reduced to crunchy, nutty tidbits. Crispy, meaty, crunchy, with the zing of citrus, the freshness of the herbs and the occasional warm note from the fried garlic make this a near perfect plate of food. This recipe work with any bass-like fish. I mostly use Pacific rock cod (rockfish), but perch, large- or smallmouth bass, walleyes, black seabass, croakers, puppy drum, porgies, large crappies or bluegills would all work. The ideal length for the fish is about the size of a big dinner plate. You can use larger fish, but you’ll probably want to split one fish for two people, and that’s not quite as fun as getting to tear into a fish of your own. Everything here should be pretty easy to find, with the possible exceptions of the lemongrass and the fish sauce. Both are readily available in larger supermarkets now, and any Asian market will have them. If you can’t find it, use soy sauce.